The Lady And The Unicorn: Does Your Brand Have a Sixth Sense? On a recent trip to Paris I visited the Musée de Cluny, an excellent gallery dedicated to the art of the Middle Ages. The star exhibit is a series of six tapestries featuring a beautiful noblewoman accompanied by a lion, a unicorn and a maidservant. 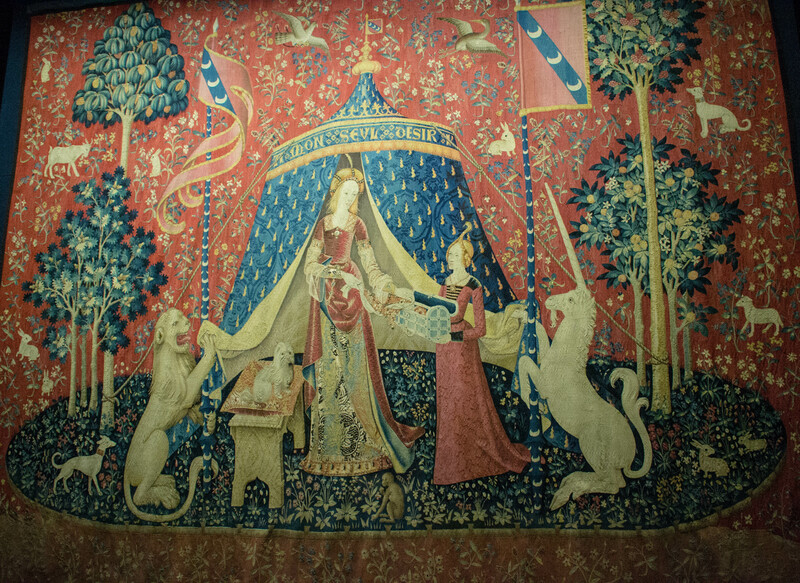 The Lady and the Unicorn tapestries date from around 1500 and are elegantly woven in wool and silk. The fair-haired woman inhabits a red field of wild flowers, exotic shrubs and small mammals. She is dressed in aristocratic finery and accompanied by colourful flags and courtly possessions. The serene white unicorn looks on attentively. On close inspection we realise that each of the first five tapestries is dedicated to one of the human senses. The lady strokes the unicorn’s horn (touch), takes sweets from a dish (taste), makes a wreath from carnations (smell), plays a pipe organ (hearing), and consults a looking glass (sight). But the sixth, slightly larger, tapestry is something of a mystery. It is the only one with writing. In the background a tent carries the inscription, ‘À mon seul désir,’ which could variously be translated as ‘My only desire,’ ‘My desire alone,’ or ‘By my will alone.’ In the foreground the now smiling noblewoman has her hand on a necklace in a casket. It’s the same necklace that she wears in the other tapestries. What might be the meaning of this sixth tapestry? What is the noblewoman up to? What is her ‘seul désir’? At first I mournfully imagined that our heroine was taking the necklace from the casket because her one overriding passion was material wealth. But scholars have suggested that the woman is in fact replacing the necklace in the casket, thereby renouncing earthly attractions. She is, they say, demonstrating that free will controls the senses and that the human heart governs our desires. Others have gone further to contend that this image represents the triumph of understanding and the power of love, our unique sixth sense. Back at my desk in London, I was struck by the thought that most modern brands inhabit the realms of the senses. They offer some combination of perceptible rewards: visual or tactile; auditory, olfactory or gustatory. But how many brands have a sixth sense, something that rises above and beyond basic passions; something more soulful and spiritual? Does your brand have free will? Does it have a heart governing its desires? Does it have extrasensory perception, an instinct to see the unseen; to comprehend the causes behind events? These questions may sound a little abstruse. But we live in an age of commodification; of cold calculation and cost comparisons; of machine learning and automated inference. The relentless forces of procurement are all powerful and ever present. If brands are to survive and prosper in this unforgiving environment, they must create more space for the intangible, irrational, immaterial. Like the mysterious lady in the Musée de Cluny tapestries, they must rise above the merely sensorial. It’s the only way to establish credible difference; to justify premium; to earn enduring loyalty. Of course, whilst this may be true, we should beware of over-thinking things. Some have noted that to medieval eyes the unicorn was quite obviously just a symbol of male sexuality. The interpretation of the Lady and the Unicorn tapestries may not be as nuanced as scholars would have us believe.